Turn your garage into a high tech detail shop! The Metro Wall Mount Vac N Blo Vacuum is a powerful vacuum and blower in one convenient, wall-mounted unit. It's out of your way yet always where you need it. The Metro Wall Mount Vac N Blo Portable Vacuum boasts all the features of the portable model in a convenient wall-mounted design. The Metro Vac N Blo Portable Vacuum is one of our most popular vacuums. Its versatility and performance are legendary. Now you can enjoy all its benefits from a convenient location on your garage wall. The Metro Wall Mount Vac N Blo Vacuum has 4.0 peak horsepower and the versatility of being used as a vacuum or a high powered blower. Clean and dry your car, boat, RV, or ATV. Inside your vehicle, use the included dust brush and crevice tool to extract dirt from the carpet, air vents, and even that tricky space between the seats and the console. The included micro cleaning tools gently clean the stereo face and instrument panels. Dust has nowhere to hide when the Metro Wall Mount Vac N Blo Vacuum is on the job. For the exterior, use the Metro Wall Mount Vac N Blo Vacuum to dry your vehicle faster and more easily than hand-drying. The Vac N Blo blows away water droplets before they have time to become mineral deposits. Blow water out of seams and crevices to prevent drips. Plus, the Metro Wall Mount Vac N Blo Vacuum allows you to dry the wheels without sacrificing any of your towels. This blower is also handy for blowing dust or leaves off your vehicle without the rubbing involved with dusters or towels. The Metro Wall Mount Vac N Blo Vacuum is also an essential tool for household cleaning and chores. Blow saw dust and leaves out of the garage, vacuum up potting soil, or inflate a raft. The Metro Wall Mount Vac N Blo Vacuum includes an inflator attachment for blowing up pool toys and other inflatables. 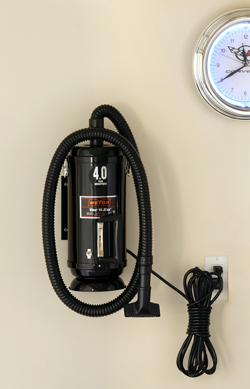 The Metro Wall Mount 4 HP Vac N Blo hangs conveniently on the wall in your garage. For interior and exterior detailing, there is no match for the Metro Wall Mount Vac N Blo Vacuum!